COLORADO SPRINGS, Colo. — The Colorado Mathematical Olympiad will return to the University of Colorado Colorado Springs for its 31st year on April 25. An estimated 400 middle and high school students from around the state will meet in Berger Hall at 8 a.m. and then on to the Gallogly Events Center at 9 a.m. to begin the competition. Participants are given four hours to complete five essay-style problems. On May 2, Alexander Soifer, CMO chair and professor, Interdepartmental Studies, will review solutions to the problems and present awards. The award ceremony is scheduled to begin at 1:45 p.m. in Berger Hall with a reception to follow. The CMO is a chance for middle and high school students to test their talents and ingenuity while competing for medals, scholarships and other prizes. The CMO is the largest essay-type mathematical competition in the United States with participants competing against one another, grades 6 through 12. Prizes are provided by the competition sponsors, such as Wolfram Research, Mu Alpha Theta and Springer Publishing. UCCS Chancellor Pam Shockley-Zalabak will offer gold, silver and bronze medalists a scholarship to UCCS. Other prizes include scholarships, Casio calculators, math software, and books written by Alexander Soifer. Student participation is free and open to all students grade 6-12. There is no limit on the number of schools or students who may participate. Everyone is welcome. 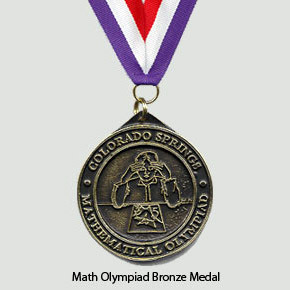 The Colorado Math Olympiad is supported by Wolfram Research, the Office of the Chancellor, College of Letters, Arts, & Sciences, School District 20 and School District 11, Greg Hoffman, and Alexander Soifer. For more information about the Math Olympiad, and to view problems from previous years, visit http://www.uccs.edu/olympiad. The University of Colorado Colorado Springs, located on Austin Bluffs Parkway in Colorado Springs, is one of the fastest growing universities in Colorado. The University offers 37 bachelor’s degrees, 19 master’s and five doctoral degrees. UCCS enrolls about 10,500 students on campus annually and another 2,000 in online programs. For more information, visit www.uccs.edu.